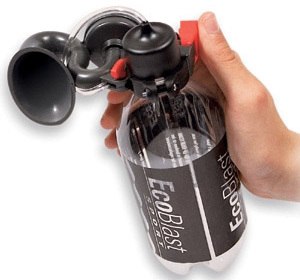 EcoBlast Rechargable Air Horn Is Like A Super Soaker For Sound | OhGizmo! With the EcoBlast Rechargable Air Horn not only do you have an economical way to scare the crap out of your roommates at the crack of dawn, but it’s environmentally friendly too! Like the Super Soaker, the EcoBlast uses a plastic tank that can be refilled, with air in this case, from a bike pump or air compressor using a standard valve. The volume on the air horn is adjustable too, with it maxing out at around 115 dB, and on a single ‘charge’ you can expect to get over 70 blasts. So if you’ve always wanted to be ‘that guy’ at the baseball stadium you can order one from Things You Never Knew Existed for $29.98. dimana saya bisa dapatkan horn ecoblast ini.tolong infonya thanks.